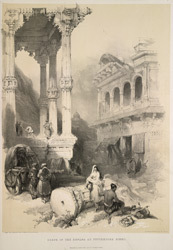 Plate three from HH Wilson's 'The Oriental Portfolio'. In Wilson's words: "The principal object of notice at Futtehpore Sikri in the Durgah, or tomb of the saint, Sheikh Selim Chishtee, to the efficacy of whose prayers Akbur ascribed the birth of his son and successor, Selim, afterwards known as Jehangir ... East and north of the Durgah, inclosed with stone walls, five or six miles in length, and diversified with battlements and towers, in the space formerly occupied by the emperor and his nobility and still strewed over to a great extent with the vestiges of princely dwellings ... The ruins are very extensive, and present considerable variety of purpose as well as construction; thus we have a hall of audience, a sleeping chamber, stables, bath, a caravan serai, a royal race-stand, and different mahals or apartments of the emperor's wives. One of these is represented in the accompanying view, and displays the mixture of Mohammedan and Hindoo styles ... These mahals are assigned, by local tradition, ... to specific individuals, and we may have here the apartments of the fair daughter of Raja Birbul, the favourite associate of Akbur."